While little known among the current fans of science fiction and fantasy, Gertrude Mabel Barrows (1883-1948) was one of the first women who wrote for the pulp magazines of the early 20th century. Her career was short, but made an indelible mark on the genre later known as Dark Fantasy. Her first published story was produced while she was working as a stenographer at a department store office. "The Curious Experience of Thomas Dunbar," published by Argosy in March 1904, appeared under her real name. She married British journalist Stewart Bennett in 1909. Widowed in 1910 and with an infant daughter to support, she continued working as a stenographer. It wasn't until her father died and she had to care for her invalid mother that she returned to writing for the pulp magazines. 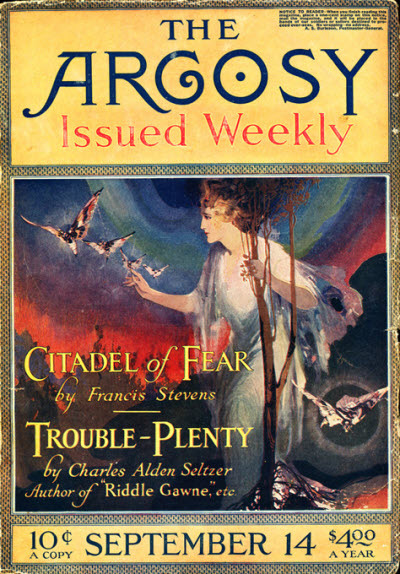 "The Nightmare" was published in All-Story Weekly in 1917. Although she'd requested the pen name Jean Vail, the editor published the novella under Francis Stevens. The positive response by readers led to Bennett's decision to continue using Francis Stevens for her work. For the next few years, she wrote short stories and novellas for the pulps. Focused on science fiction and fantasy, her stories were dark explorations of the future and the failings of human nature. "Friend Island," published in 1918 by All-Story Weekly, featured a world dominated by women, and a fantastic tale of a woman sailor and the shipwreck that nearly led her into matrimony. Alas, he turned out to be less than a perfect mate by the end of the story. She published her first novel, The Citadel of Fear, in 1918. The lost world story about a forgotten Aztec city is considered her best novel. 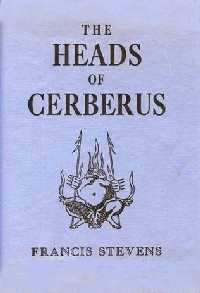 Her only science fiction novel, the dystopian The Heads of Cerberus, was published as a serial by The Thrill Book the following year, and her supernatural novel Claimed was first published in 1920. Although there is speculation that her work influenced H.P. Lovecraft and A. Merritt, there is no real proof that this story is true. She did influence many of her contemporary science fiction and fantasy writers. In fact, she was called "greatest woman writer of science fiction in the period between Mary Wollstonecraft Shelley and C.L. Moore" by critic Sam Moskowitz. Her last known story was published in 1923 by Weird Tales. The two part story, "Sunfire," was also reprinted as a trade paperback in 1996. While her writing career ended after the death of her mother, her stories have been published in several collections. Sadly, she was estranged from her daughter from approximately 1939 until her death in 1948. Read a free copy of "Friend Island" on Project Gutenberg. Great series Ruth! Thank you for writing about the female writers most of us never heard of. Honestly, I'm more familiar with later authors, so this exploration has been eye-opening for me too! Today, Ruth de Jauregui, shares insights into the life of little known, but highly influential, Francis Stevens. I am really enjoying this series, Ruth. What a great post Ruth. Francis probably started writing as stress relief or mental therapy like so many do. She probably never intended to influence so many others. It’s a wonderful reminder to keep plugging along even if I don’t feel very appreciated now. Who know what the future holds. Yet another author to add to my read pile. I"m happy to share as I learn more about the early days of science fiction and fantasy! Thank you! Ruth De Jauregui shares another great female author in Sci-fi. Read about Francis Stevens and the impact her short career made on future Authors. Today on #OurAuthorGang, Ruth de Jauregui​ talks about Francis Stevens, one of the first women authors of science fiction to write for the pulp magazines. Very cool, Ruth. I never heard of Francis Stevens before. I can easily see this great series of articles you're writing turn into a fascinating book. Wow! I never even thought of that! +Ruth de Jauregui -- do it! My contribution to #OurAuthorGang today. A fascinating glimpse of an early science fiction writer and her influence on the Dark Fantasy genre. Really interesting post, Ruth. I've not heard of Frances Stevens, but I shall look up her works. Isn't it always the case that female writers are overshadowed by their male counterparts. Is it a deliberate publishing thing? I'l check out 'Friend Island'. Fandom didn't even realize that Francis Stevens was a woman until it was revealed in an intro to one of her books after her death. The early 20th century definitely had women narrowly defined in their roles. Being a huge science fiction fan since I picked up the first book (I think it was an Edgar Rice Burroughs), I don't know why it was assumed that women weren't interested in reading or writing sci-fi. Wow another exciting woman right up my alley. I got a collection of her books for my Kindle. Can't wait to read them. +Chris Weigand I have a Kindle, but I prefer real paper!! I'm a bit old-school about my books. Another fascinating post about women in sci-fi genre by author Ruth deJauregui. Another great woman of Science Fiction and Fantasy with Ruth de Jauregui. Francis Stevens was leading the SciFi movement and many may have not known her. Interesting feature. I love when I discover new information about famous women in literature. And her genre is something I do have an interest in. I'm going to look for the free copy of Friend Island. It sounds intriguing. I totally enjoyed her story. Glad it was available to read online! +Ruth de Jauregui I agree! Great post. Friend Island definitely sounds like something I'd like to read. Thank you. It was really good, I enjoyed it!